I do not know how to play the game however I need to learn and learn fast otherwise I may be out of job and although this is not the worst thing that can happen in life, I also don’t have a fall back plan. I have two beautiful 2.5 year old twins and for them I need to get going and make the best of this situation or find the out so I can continue to earn and provide for them and our future. I have worked at a major entertainment firm for 18 years – I started as an assistant and rose to the director level overseeing administrative and operational components at two locations. I have been responsible for and managed financial, project and procurement related activities at both sites with a good measure of success and have done my best to develop my team to meet or exceed all challenges. The two areas were merged into one approximately two years ago under a single senior executive, Henry, whom I have worked for and been loyal to for more than 10 years. As a result of this merger Henry was asked to develop a group to oversee all of the administrative and financial operational requirements. A position that I believe I was being developed for and would have been successful in however Henry had other pressures. Lucinda was a director from another area reporting to Henry that had been compressed for a long time however Lucinda’s reputation and tactics were questionable however Henry was asked to make it work and in turn I was asked to make it work under this person; In other words I was not getting promoted but I still had my job and Henry would continue to support me. Lucinda apparently rubbed many people the wrong way including Henry and/or there was no way that Henry was ever going to let this person succeed needless to say this created a very stressful environment and Lucinda was ultimately not give the position and we were told by Henry that he would be interviewing for a replacement. Well the replacement, Francine, was found from within the company and hired – I was again asked to support Henry with this change and of course my response was that I would do whatever was asked to help this re-structure succeed as well as take on additional responsibilities at the second site. Well as it turns out Francine appears to be great at first however something has transpired between her and Henry within the first three months that has strained the relationship and at this time I find myself between the two of them, I’m trying to remain neutral and do the best job I can for the company while dealing with the rhetoric from Henry and threats against my career from Francine. My spider sense has also been triggered and I believe that Francine may have been placed by executive management to manage Henry so I have convinced myself that the line I was walking on has now become a thread; If this indeed is a take out play by executive management, then I need to survive regardless of who wins; How do I do this? What is being said and asked of me is discomforting and difficult because two of my values are trust and loyalty and unless I was to have a lobotomy, I cannot see how I could change these – I am not a cutthroat person and believe that I should be judged on my work and performance of my team and not how well I played the office politics game however here I am asking you for the help and/or insights that I desperately need to make this happen. Responsibilities are being assigned away from me by Francine and when I ask about it I’m told that I need the help and the department should be cross trained – both are points that I agree with however I am suspect of her motives. The rest of the team reporting directly to Francine has aligned themselves with her and Henry has told me point blank to get some balls; I have balls but not when it comes to stabbing anyone else in the back – of course it looks like I may have to….??? Well, just what kind of entertainment firm are you with, a production company for soap operas? It certainly sounds that way! Seriously, we’re not making light of your disturbing scenario, but welcome to the politics club. It can indeed be crazy-making can’t it? Woody Allen tells the story of complaining to the psychiatrist about his cousin who thinks he is a chicken, so the therapist asks why his family doesn’t have the cousin committed to an institution, whereupon Woody replies, “Well, Doc, we need the eggs!” Similarly, company life can be zany (like your situation), but most of us hang in there because “we need the eggs.” Similarly, the non-logical dynamics surrounding you may be unavoidable for you since you, too, may need to just cope with them. It does sound like a real teenage Peyton Place or the OC TV show. A. What is meant by what you call the compressed area of Lucinda? What tactics did she use that were frowned upon, specifically what kinds of disloyalty and cutthroat behavior is Francine or Henry pushing you to practice? B. How exactly is Francine threatening you? C. What does Henry want you to do that requires balls? And if he knows that Francine is threatening you, and is still telling you to be tougher, what does HE want from you? Would he not understand that you are his ally more than hers? Given the precarious tight-rope you are on, we first recommend being very clear and specific in your documentation of the problems, more precisely than you have been with us. That is not an attack, but simply feedback that two fairly bright guys are having trouble with the amount of general statements without knowing more exact behaviors, requests, demands, and words being thrown at you. Do a better job of clarity in notes that you keep about this situation. If your entertainment firm shoots western movies of cowboys, you’ll be familiar with how often the bad guys would shoot their guns at their weaker victims’ feet while yelling, “Dance!” Since you are not the one with the guns, unless you get on your horse and leave town, you will indeed have to do some dancing given the scenario. You use lots of negatively charged language to describe your dilemma, which we understand, but it undoubtedly is creating more negative, trapped emotions than you would have if you “reframe” what you’re being asked to do with less absolutist, inflammatory wording. For instance, playing the game must make you feel like you’re copping out on integrity when you’re not. Nor are you being cutthroat, or would you be turning your back on your core values of trust and loyalty were you to use evasive tactics or even play against one or the other since they are each forcing you into an untenable tight spot. You are simply trying to survive and you are still a good person! So try to remember the more balanced posture that you do exhibit at spots in your letter (e.g., leaving would not be the worse thing in life, they are indeed making life difficult and uncomfortable, which are more poise, emotionally less reactive ways to frame the challenge). You might be right that Henry is being taken out by Francine with the blessing of top management, especially if he is theoretically and officially higher in rank than Francine and still locking horns with her. Someone must be making her feel safe, or she’s an idiot, and it seems henry knows it. Otherwise, we’d think he could put her in her place (or worse) given he’s a senior executive and she is only a Director and one that he himself hired, meaning there might be a ploy and agenda by people even more powerful than Henry. Still, he HAS hung out and played with the big dogs more than you have. You seem to have more chips in your Political Bank Account with Henry. You seem to feel more aligned with him, in spite of his behavior being troublesome of late. It might be worth having a sit down with Henry to talk frankly about the tight spot you’re in, disclosing that you feel loyal to him but are worried that the balls he wants you to have could cost you your job given Francine’s threats and no guarantees of protection from her. So invite him to strategize, or let him know tactfully that you might let Francine believe you are more with her than you truly are to survive and that you do not want him to ever misinterpret that. Now, we know this is challenging if (1) his stock is so low he will be ousted, and/or (2) he may be demanding that you either publicly side with him or you are his enemy. But a frank conversation and appeal to your history together may break through his armor and behavior that must be coming from fear. Here’s where we WANT you to be general and vague, like you were a bit too much so in your letter. Only here, use lack of specificity and non-committal language to your advantage when Francine wants you to voice your agreement and support. Use paraphrasing and active listening to show acceptance of her feelings without necessarily stating your own beliefs that Henry could view as your taking sides (e.g., “Wow, Francine, you obviously feel strongly about this… I can see that you think Henry is way off-base with his idea, etc.”). Make sure you “decode” any inflammatory language or name-calling and rinse it out of your expressions of empathy so you are even, neutral and self-controlled, measuring your words. Abbrakadabra! Easier said than down, we know. Two reasonable people can disagree and I must say I can’t blame you for feeling that way…“How can I support you without bailing on my responsibility to the whole company?”…”Wow, I have to think more about that but will certainly do so…” etc. Again, we don’t know exactly what the parties are pressuring to say or do, so it’s unclear how this tactic fits, but think about it. As we suggested with Henry, you might with him or even Francine, decide to take a risk and shoot straight for the target which is some way of constructively confronting one or both with the tightrope they are placing you on, the “damned if I do, damed if I don’t” trap. Note here that you have some friends getting divorced and you pride yourself on supporting both and would like to handle the work conflict similarly, staying supportive of the business needs of both without making it personal. Of course, in a sense, you would be calling the bluff of their implied or actual threats since it’s putting all your chips in a last ditch poker bet that neither will fire you. Here, remember that you do this as a last resort and if you need to pull that tactic, you can’t lose what you don’t have anyway. If it’s a crap situation and you might leave voluntarily to get out of a toxic scene (definitely a grade B or C movie! ), then what have you got to lose? 1) While you might be being marginalized and edged aside by Francine, as shown by the weaning from responsibilities which devalues your contribution, you are not clearly being fired or forced out. Bottom lining it, it’s sometimes nice to have a job to complain about, isn’t it?? Many wish they had your problems. 2) You deep down may be well-respected by team members who are playing the game and you may have lots of points that make it unlikely you will be axed either by Francine or Henry. If you ARE, you will have documented in cased you need it. 3) You say you do agree with the spreading of your tasks to others for cross-training and that you do have a bit too much on your plate responsibility-wise, so who cares what other motives Francine may have? Is it the worse thing to be well paid, not be fired, and have a less stressful workload, especially if your job now invites you to invest less emotional energy? 4) Keep perspective by remembering your real purpose in life, which probably comes to you more when you gaze down upon your beautiful twins than when you wrestle with this hassle. Twenty years from now, that’s what matters. You already know this. We’re just reminding you of what you already know. Regardless of how it turns out, you are still YOU. 5) If the TV show gets canceled: Brush up your resume and start putting out feelers. Since you are in the entertainment industry you can tap into powerful people who can help you broadcast your message and land an even better gig. Create a ‘brand’ for yourself that sizzles. We know we have not said to do one thing or another, but hopefully going through some options may have helped you. 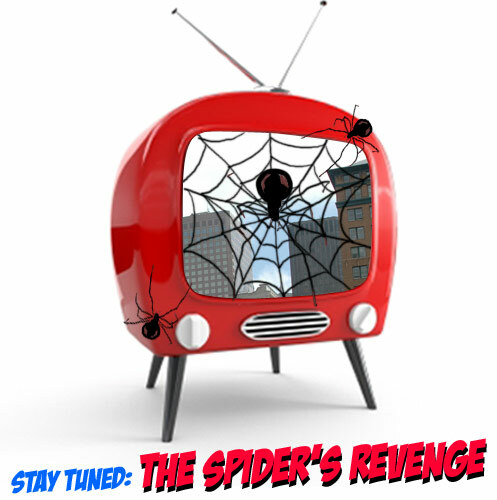 Now use that “spider sense” of yours to intuit which of the strategies is the wisest for you. Let us know!